Hepatic lipidosis is characterized by the excess accumulation of fat in the liver and is a common cause of potentially reversible liver failure in cats. The liver is responsible for a variety of important functions, including the metabolism of carbohydrates and fats, the synthesis of proteins and vitamins, the storage of vitamins and iron, the production of substances necessary for blood clotting, and the removal or breakdown of toxins. Because the liver is involved in many crucial functions, a cat with liver disease may show a wide variety of symptoms. These may include lethargy, anorexia (loss of appetite), weight loss, weakness, jaundice (yellowing of the skin, eyes and gums), vomiting, diarrhea and behavioral changes. Hepatic lipidosis is just one of many liver diseases which can cause the clinical signs listed above. It can be the primary problem or secondary to another disease process. Possible primary disease processes include inflammatory bowel disease, other liver disease, cancer, pancreatitis or social interaction problems (i.e. introduction of a new pet or other stresses at home). Factors that may be associated with the onset of hepatic lipidosis include stress, obesity, anorexia, diet change, nutritional deficiencies, diabetes and hyperthyroidism. 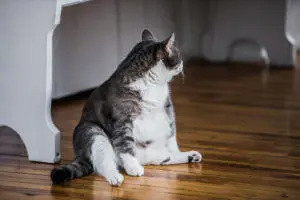 The typical cat with hepatic lipidosis has recently lost a significant amount of body weight, has a poor appetite, and is middle-aged and overweight. Excessive amounts of fat are broken down from the cat’s peripheral fat storage during periods of fasting or decreased food intake. This fat is then transported to the liver. The liver should then process this fat and export it to the rest of the body in a new form. In cats that develop hepatic lipidosis, this process is impaired and the rate of fat export from the liver is much slower than the rate of fat intake, resulting in fat accumulation within the liver cells. Damage to the liver is caused by swelling of the liver cells with excessive fat. At a minimum, impairment of liver function occurs, and in those cats with severe disease, overt liver failure results. The suspicion that a cat is suffering from liver disease is confirmed by physical examination, a thorough history including diet and medications, comprehensive blood work and abdominal ultrasound. The definitive diagnosis of hepatic lipidosis requires visualization of fat globules in the liver cells; this can only be accomplished through needle aspiration or biopsy of the liver. Regardless of the cause, the basic treatment for hepatic lipidosis is the same. Many cats will be dehydrated and completely anorexic when brought to the hospital. Intravenous fluids are used to correct the dehydration. Most cats with hepatic lipidosis refuse to eat, yet the only way to reverse the process of fat accumulation within the liver is through aggressive feeding. This supplies your cat with his or her full caloric requirements. Force-feeding your cat is an option, but most cats are not very cooperative, and meeting their caloric requirements is difficult at best. Cats also seem to develop food aversions quite easily, and the unpleasant experience of force-feeding may further delay your cat’s return to self-feeding. Placement of a feeding tube (percutaneous gastrostomy tube or esophagostomy tube) into the stomach or neck, respectively, is the most satisfactory method to manage feedings. The percutaneous gastrostomy tube is placed using an endoscope and requires a short duration of anesthesia. An esophagostomy tube also requires anesthesia. This tube is placed into your cat’s esophagus through a small hole in the neck. Some cats require supportive care, including vitamin K to help them clot their blood, for a period of time before they are stable enough to undergo these procedures. Both options allow the cat to receive the full caloric requirement with a minimum of stress and fuss. A specially formulated recovery diet can be fed through the feeding tube for as long as it takes your cat to recover from the hepatic lipidosis. If necessary, the feeding tube can safely remain in place for several weeks to months. A feeding tube allows your pet to return home where you can perform the feedings and give medications in a less stressful environment. The expected hospitalization for a cat presenting with severe hepatic lipidosis can be up to 7-10 days. During this period of time, we will correct the dehydration, monitor for any electrolyte abnormalities that may occur, and begin reintroduction of food. As these cats have not eaten for some time, reintroduction of food must be done slowly so as to not overwhelm their system. 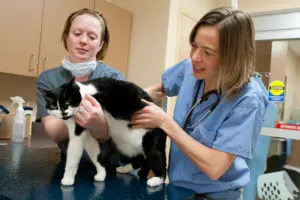 Once your cat is stable, off intravenous fluid therapy, and receiving most of his or her calculated caloric requirements we will set up a time for your cat to go home. During the discharge appointment, we will go through any medications your cat may require, demonstrate how tube feedings are done, and answer any other questions you may have. You will be expected to bring your cat in to see your veterinarian for regular rechecks. These might be more frequent in the beginning and will decrease in frequency as your cat recovers. Some feeding tubes require bandaging that will need to be changed every couple of days. Many owners learn to do these bandage changes at home and monitor for infections. As liver function recovers, appetite will gradually improve. Expected recovery time is typically 6-12 weeks, with an average time of eight weeks. When your cat is totally self-feeding for two weeks without any weight loss, the feeding tube can be removed. Recurrence of primary hepatic lipidosis is rare, and many cats that survive go on to live normal lives. Some cats have other contributing diseases that require specific long-term treatment.